We’d love your help. Let us know what’s wrong with this preview of Amish Acres by Samantha Bayarr. When a celery patch mysteriously crops up overnight in the Yoder's field, it begins to draw some unwanted suitors competing for Naomi's hand. When someone grows an oversized patch of celery in Naomi's field, she gets accused of trying to "catch" a husband. Will rumors spread by a jealous friend damage her reputation and threaten her chances of marrying the man she loves? Christian Mystery Suspense & Romance, this book has it all! To ask other readers questions about Amish Acres, please sign up. I enjoyed this book . I thought that the cover was very eye catching. Nine times out of ten it's the cover of a book that causes me to read it. I liked the characters too. Let me introduce you to the main ones of the story. Naomi Youder - A young Amish lady who hasn't seen the man she loves for two long weeks. He hasn't asked her to marry him yet and she wonders if he ever will. She even wonders if he loves her as much as she does him. Ruthie Youder- Naomi Youder's 18 year old sister. She is ready I enjoyed this book . I thought that the cover was very eye catching. Nine times out of ten it's the cover of a book that causes me to read it. I liked the characters too. Let me introduce you to the main ones of the story. these sisters haven't been getting along at all since their mother died about a year and a half ago. Katie Troyer- Naomi Youder's best friend, who has just announced she will be getting married in the fall. Naomi can't help but feel jealous since she has no idea if the man she loves will ever ask her to marry him. Seth Troyer- Katie Troyers brother. He's always had a crush on Naomi. Of course she only thinks of him as a friend. Annie Lap- Community gossip and trouble maker. Not above making up stories about other people and spreading lies about them . She has an eye for Jeremiah, Naomi's boyfriend. In fact she would do what she could to break them up. She would stoop to anything to get his attention. Jeremiah- has known Naomi Miller all of his life. Grew up together, attended school and singings and everyone thought of them as a couple. Jeremiah has been busy all summer and hasn't spent much time with Naomi. Silas - Jeremiah's identical twin. He is attracted to Annie Lap , who doesn't act as though she knows that he is alive, because she's too busy chasing around after Jeremiah . The main point of the story is that if you love someone never take them for granted. Let them know you love them before it's too late. All readers of Amish Fiction would like this book. I'm glad I decided to read it and I hope that you will read it also. The Celery Patch is a wonderful start to Samantha Bayarr's new series Amish Acres. This storyline definitely keeps the readers on their toes. There are so many exciting twist and turns that it made it difficult to put this book down. There were so many lies, manipulations, and unexpected events in this story that I found my self just shaking my head. I enjoyed the characters for their realistic personalities. I really disliked Annie right from the first few pages. 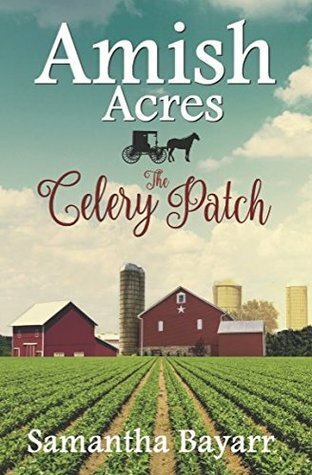 She is definetly a force to be r The Celery Patch is a wonderful start to Samantha Bayarr's new series Amish Acres. This storyline definitely keeps the readers on their toes. There are so many exciting twist and turns that it made it difficult to put this book down. There were so many lies, manipulations, and unexpected events in this story that I found my self just shaking my head. I enjoyed the characters for their realistic personalities. I really disliked Annie right from the first few pages. She is definetly a force to be reckoned with. I loved Naomi even tho she was naive and impatient. Jeremiah could definetly use a course on not letting conniving young ladies get the better of him even tho it wasn't all his fault. I really enjoyed his character as well. I loved the ending but I won't say why and spoil it for other readers. There were a lot of positives in this storyline like family, love, and faith. I was not given a complimentary copy of this book to read and review. I was not approached by anyone to post a favorable review. I have rated this book with five stars for meeting my expectations of a fantastic story that I can highly recommend to others. The book never did delve into the meaning of planting a celery patch in the Amish community. I was able to gather the gist of it but still don't know if I fully understand it. The celery patch being at the center of the story, I would have assumed that would be the first thing explained! All in all, it was a cute short story but didn't blow me away. The use of Amish terminology was very interesting. Misunderstandings can cause many problems. The author wrote a fabulous storyline with some twists and turns that had to be worked out by the great characters. I enjoyed this book and definitely recommend for others to read The Celery Patch. This is Book One of the Amish Acres series. I'm looking forward to Book Two. I purchased this book and I'm not required to review it. This review is one hundred percent my opinion. This book took me to so many levels of feelings. Sometimes it was almost too much and I had to put it down( but only for a few seconds). I enjoyed this book so much and it made me think about my own life and the way I was living. I can’t wait to read the next book from this awesome author. This book drove me crazy trying to find out if Naomi and Jermiah would end up together. It was we written every chapter kept you engaged gossiping Annie got on my last nerve. Thankfully Jeremiah realized the error of his ways and came to his senses. Hope to read more about this group. This book keeps you guessing. I loved it. If you love to try and guess what's going to happen, and you find yourself talking to the characters in your book, then you'll love this story. I can't wait to read the next book. Samantha Bayarr is a gifted author. I would recommend all of her books. When a celery patch mysteriously crops up overnight in the Yoder's field, it begins to draw some unwanted suitors competing for Naomi's hand. When someone grows an oversized patch of celery in Naomi's field, she gets accused of trying to "catch" a husband. I found this story to be a great way for the characters to show how a young Amish woman dealt with her feelings for a lifetime friend. The author did a good job of telling her story. I enjoyed reading celery patch in the middle of the book it had started to get boring but when I started to get closer to the end I started enjoying reading the book more but over all it was a good book. This was the first book where I really questioned the author's experience & research into the community. The story was longer than needed but sweet in the end. What f u n! This was such a fun story based on many misunderstandings! I won this book on goodreads, and am glad I did! My unsolicited opinions are all my own. Very sweet romance story - a little predictable but still good. I just love the Amish fiction . A story of faith and love! This is one of the worst Amish books I have ever read. The characters are one-dimensional and trite. Such a contrast after reading Beverly Lewis books. This was a very good read. It flowed nicely and held my attention. I'm anxious for the release of the next book in this series. All the wishes of a young maiden. Family, friendship and love is in the book. Fun read to make all things possible. This is a true life adventure. When love takes a bad turn. One girl caused a lot of trouble, but true love wins. I recommend it to all. A wonderful story, to be expected, written by Samantha! It kept me holding my breath, laughing out loud, and swallowing the lumps in my throat! All with a surprise ending! This book is one of my favorites by Bayarr so far. It made me hold my breath, want to scream at the characters to wise up, and made me cry art the end. A great story. I enjoyed reading The Celery Patch. It was fun and interesting. I look forward to reading more books of Samantha's . It was a good read, short and very enjoyable! I would recommend it to my friends! Misunderstandings happen all to often. I just love this book can't wait to read the others. I couldn't put the book down had to see what was going to happen, glad it turned out the way it did. Loved everything about this book!! The characters and all were so well written!! Hopefully Annie learns her lesson soon... looking forward to the next book!! This book was very well written with a lot of suspense. The celery patch was growing in the field and there was a big question on who planted it. Even after death, a mother can still show her love. She can still provide wisdom and live for her daughter. Samantha Bayarr has our done herself. I could not put this book down. I laughed, gasped and took the adventure with Naomi as she tried to unravel the lie she had told.